I've shared my love of bright maxi dresses recently, but you can't beat a classic black maxi dress. It lets you wear colourful accessories without worrying about colours clashing. When I bought the embellished maxi dress below I got rid of an older black maxi dress I had, but then a few months later picked up a second halter neck one in an opshop sale. While I'm not sure I need two black maxi dresses, I have been enjoying having both in my wardrobe. A black maxi dress is a neutral base that lets you wear any other colours you like. This maxi dress always feels a little special with the embellishments on the neckline. I'm aware that if I try to 'save' it in my wardrobe for a perfect occasion it will never get worn. While it's nice to feel dressed up for something like a family photoshoot, it's also good to add a little sparkle to everyday and so I wore this out to playgroup in the morning. It was definitely overdue a wear, last being worn almost a year ago while I was pregnant! It was worn to playgroup then too as I felt it was overdue a wear, ha! I then foolishly attempted to go out in the afternoon again, where both the boys greatly amused the people waiting in line at the post office as I tried to mail some parcels of things I'd sold on ebay. Luckily they didn't get up to too much mischief! Last worn: Ray-Ban Wayfarer, embellished maxi dress, Balenciaga gladiator sandals, aquamarine mini MAC. Other ways to wear: embellished maxi dress for Christmas day, pink Balenciaga gladiator sandals and shorts, aquamarine mini MAC and pink vest. We had a playdate in the city so I knew a maxi dress would keep me cool and comfortable. The Queensland State Library has an area called 'The Corner' for kids which had a construction theme, perfect for Toddler T. Cooper didn't seem to like this outfit much, not wanting to be pictured near it, but I loved it. The plain black maxi dress is perfect with the printed Rebecca Minkoff mini MAC bag. I find the little Rebecca Minkoff mini MAC bags great for a day out with the boys - I can keep all the essentials on me while having my hands free (and the baby bag on the stroller) or even slip the bag into the baby bag if needed. This striped mini MAC bag hasn't been worn as much as my other ones (like the aqua one above) as sometimes I find it tricky to pair with an outfit, but a plain black dress like this is perfect. Last worn: Ray-Ban Wayfarer (above), black halterneck maxi dress, studded sandals, striped Rebecca Minkoff mini MAC bag. Other ways to wear: black halterneck maxi dress and denim jacket, studded sandals and printed skirt, striped Rebecca Minkoff mini MAC bag. Black maxi dresses provide an awesome backdrop for a colourful or printed bag - it really makes colours pop. 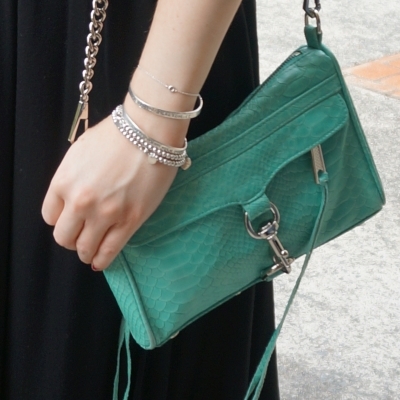 A bright bag is a easy way to change up any neutral outfit, not just a LBD. Linking up with What I Wore, Oh Hey Girl, Fashion Files, Fabulous Friday, Fun Fashion, Weekend Wear, Flashback Fashion, Friday Faves. You are absolutely right about black being easy to pair with, but I never would have thought of buying a black maxi dress. In my mind they are either light or colorful. You can never o wrong with black maxi dress! It is easy to style and perfect for day and night. I have a few black maxis and one of them is similar to the second one. I really like the embellishment neckline details of the first dress, it makes it look more dressy. I am happy to say I've purchased my first maxi dress of the year AND it's an all black one! I did have to have the bottom hemmed a bit (really short legs) but I do think it's going to be a huge staple for my pregnancy! Oh yey! It will be perfect over pregnancy for you - these two were for me! That really is a lovely dress up top. Is the embellishment beading or embroidery? Fun to see two different takes on a similar outfit. I love them both! I always liked your striped bag because I haven't seen another like it. Black maxi dresses are "it" pieces, which has me wondering why I don't own one ! You look lovely in your black maxis. It's always a guessing game how my boys will act when I need to run errands, haha! I have a black maxi dress and i always forget to wear it, then I'll put it on and go, why don't I wear this more often?? They can be easy to skip over if you think they aren't special enough! What a beautiful dress! Lovely.. So cute, I love that striped bag! Thanks so much for joining the Fabulous Friday Link Up. I agree - a classic black maxi dress can be styled so many different ways. A black maxi is such a great staple! Love both of these on you! That striped bag is adorable! You always wear maxi dresses effortlessly Mica. And you have made those big wooden bead necklaces your own style, always. These look great on you and the necklaces are the perfect accessories. P.S. Congrats on going strong with the shopping ban!